As i couldn’t find a proper guide to editing the settings of the raspbmc os via command line/ssh or ftp, here are my findings about it. As I’m pretty new to linux, there may be some faster / more efficient ways to do this (e.g. editing the setting files via nano/vi or even writing scripts to change certain settings) but for me the following works pretty well as for now. If you have some addition / comment please share them in the section below or contact me elsewhere, tia! If you’re new to raspbmc the FAQ in the official wiki are definitely worth checking out. Here you find the default logon information (user: pi – pw: raspberry), the commands to stop and start xbmc (used in this guide) and many other interesting infos. 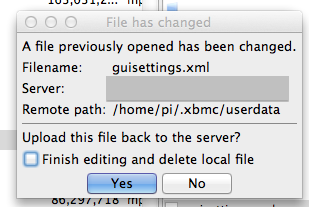 Navigate to /home/<username (default ‘pi’)>/.xbmc/userdata/guisettings.xml and open or download it. 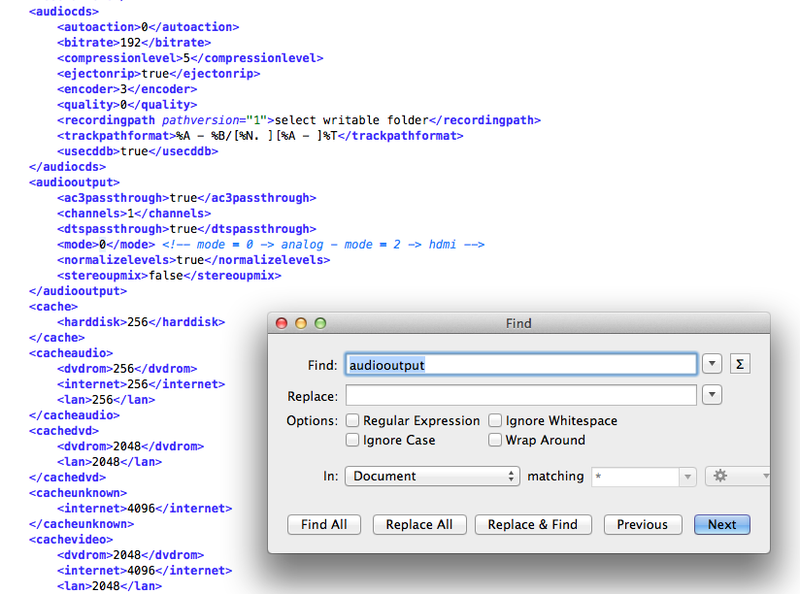 As you can see in the screenshot, I use Filezilla’s context menu to ‘View/Edit’ the remote file in my default text editor. Look for the <mode> tag inside <audiooutput> tag or any other setting you want to change and change it to the value you need. For switching audio modes see the screenshot below. Save the settings file. 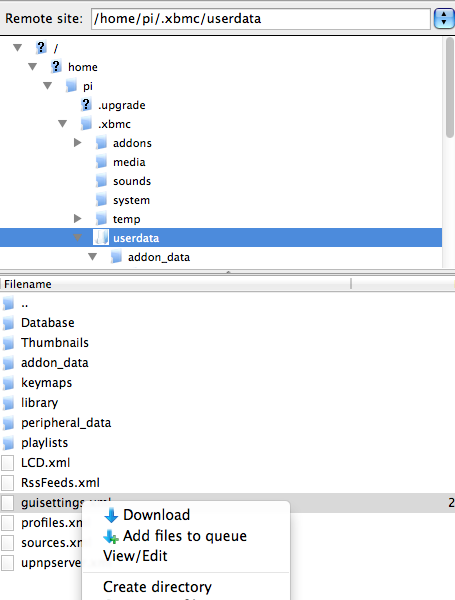 Filezilla automatically detects changes to the local file and offers to upload the changed file – you can also delete the local copy in the process. Restart xbmc via SSH to apply the changes to your running raspberry pi – using the commands found in the FAQ mentioned above. This is really great, thanks a lot to the raspbmc guy(s) for improving our experience even further! For more info about the june update of Raspbmc go here. This entry was posted in Raspberry Pi / Raspbmc and tagged audio mode, audiooutput mode, change settings, command line, filezilla, ftp, raspberry pi, raspbmc, settings, ssh on 30.03.2013 by wexoo.